New plastic body taking only the new Agfa Rapid or Orwo SL film cartridges, giving 12 views. 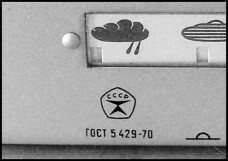 Setting by symbols – clouds to sunshine - visible on the top plate. New oversized advance lever on front of the camera. Very few made, because there was no Soviet film available on the market except Orwo SL . 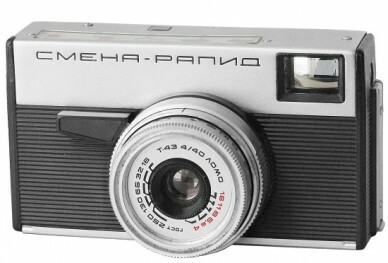 Quantity: 597.935 units (both with Smena-SL). 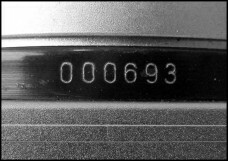 Can be found with 5-digits (camera #24911), 6-digits and 7-digits serial numbers. PK3105 - Smena Rapid #000693. PK3100. 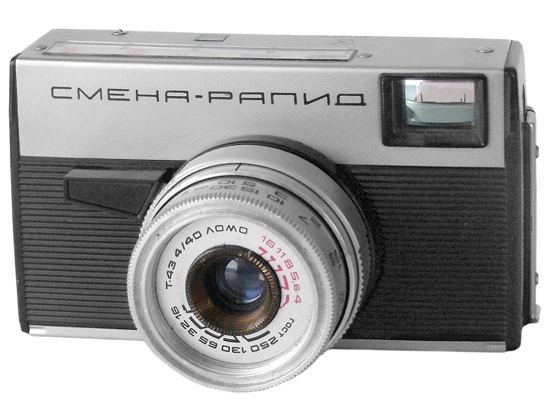 An earliest so far known version of the Smena Rapid camera. Stamped nameplate markings on the frontplate. 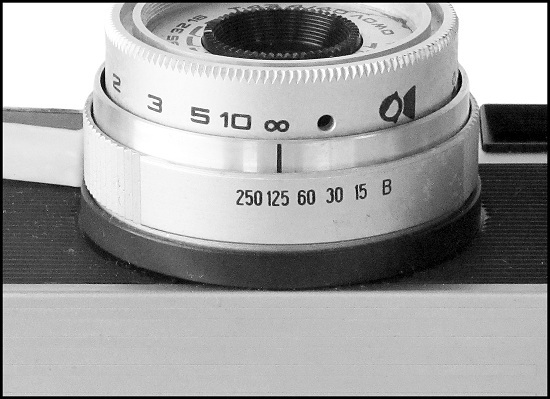 No serial number on body yet, dichromatic shutter release knob (the same knobs were used on prototype Smena Stereo cameras). Announced in the "Sovietskoe Foto" magazine in 1967 (see scan below). An only sample is known to exist in collections. Conceived by Chief Designer Anatoliy Avdonin - father of famous "Voskhod", "Sokol" and "Almaz" cameras by LOMO. 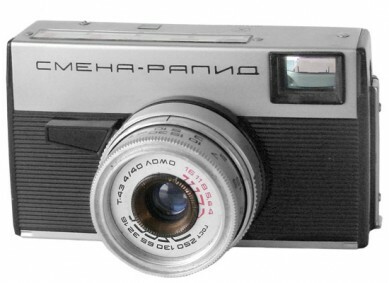 PK3100 - Smena Rapid prototype camera. PK3103. 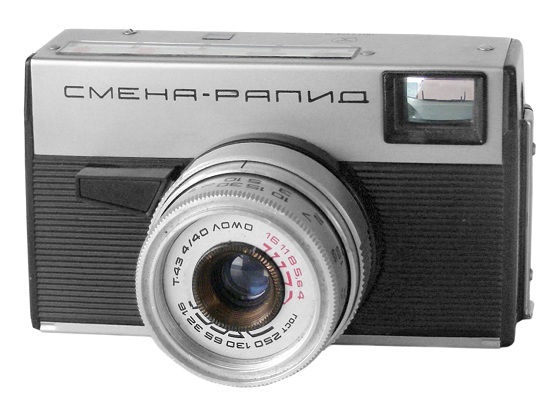 Another prototype camera almost identical to PK3100, but with few exceptions: slightly bigger nameplate markings. 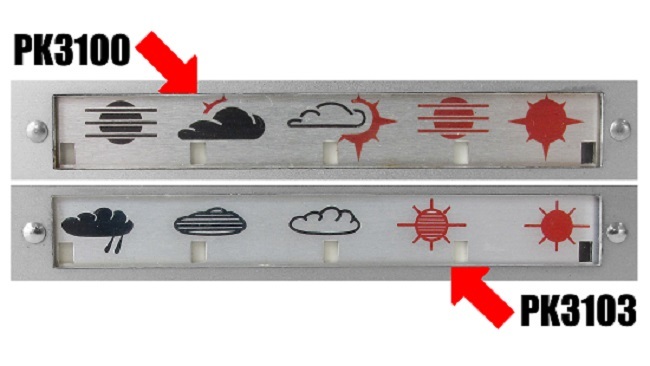 Changed design of Weather Symbols on the top plate (see the comparison picture below). Different design of the Memo disk (on the rear plate, see picture below). Very few pilot samples released by LOMO in 1967-1968. An ultra rare to find nowadays. 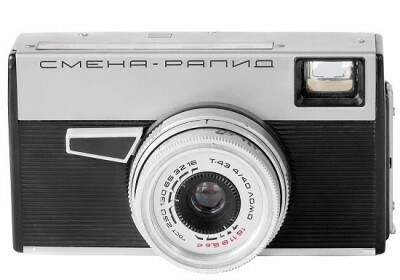 PK3103 - Smena Rapid prototype camera. PK3105. 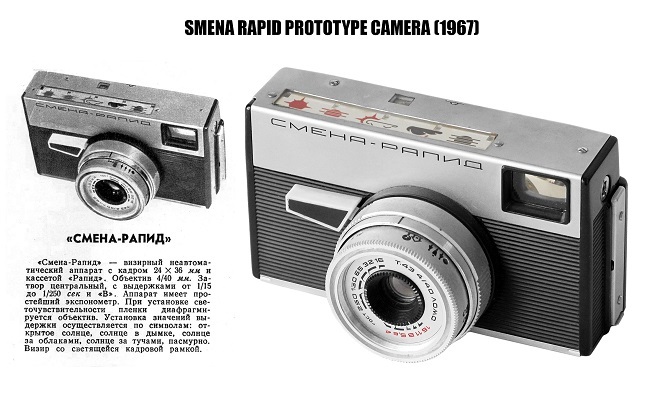 Seems to be an earliest productional version of Smena Rapid camera. Identical to PK3103, but with black shutter release knob and serial number under shutter housing. "Rapid" markings stamped on the frontplate. 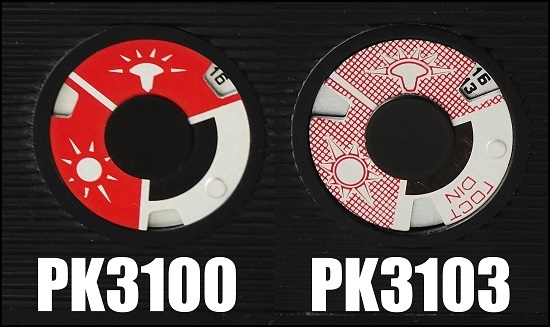 Some early samples have dichromatic shutter release knob, as on PK3100. PK3115. 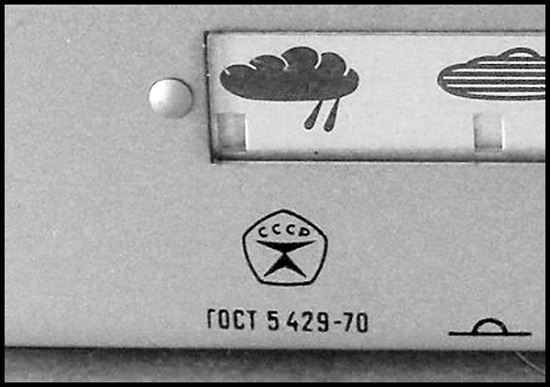 Quite common to find late version (c. 1970) with soviet Sign of Quality (see picture below) and name markings, silkscreened on the frontplate already. 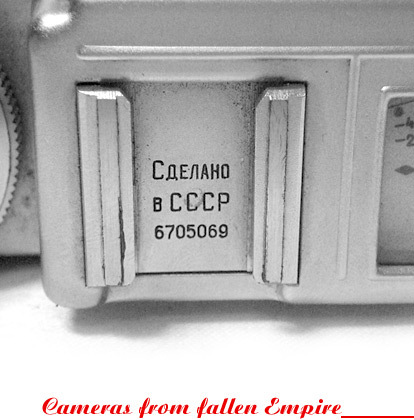 Some cameras have markings, silkscreended on the upper side of the frontplate. 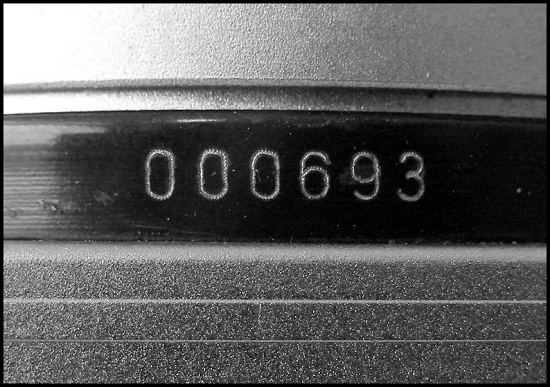 Date prefix in the serial number already. No otherwise different. PK3115 - Smena Rapid #7134540.